Our team of experienced dentists provide high-quality cosmetic dentistry enhancements, including porcelain teeth veneers. Veneers are artificial covers placed over the front surface of the teeth to improve aesthetics and protect the teeth. Veneers are a solution for teeth that are crooked, cracked, chipped, worn or missing. They can also be used in cases of severe discolouration where teeth whitening treatment is not suitable. Porcelain veneers provide a permanent solution to oral imperfections, creating a brilliant smile that lasts a lifetime. Composite resin veneers are applied directly to the front surface of the affected tooth. The ‘tooth coloured’ resin is applied one layer at a time to slowly cover the existing tooth. Each layer is shaped by your dentist until the size and shape of the teeth are corrected. Composite resin veneers are affordable and pain-free. Unlike, porcelain veneers, they don’t require any removal of the existing tooth. Composite resin veneers are not as strong as porcelain veneers but they can be altered with relative ease. Porcelain veneers are thin ‘tooth coloured’ shells. They are placed over the front of the teeth to change their shape, size, alignment or colour. Each veneer is custom-made and carefully bonded to the surface of a particular tooth. They are very strong and they look and feel like natural teeth. The procedure requires the dentist to remove a small amount of the tooth structure. This is sent to a laboratory to accurately create the porcelain veneers. Before placing each veneer on the tooth, the enamel surface may require some buffing to allow the thickness of the veneer to sit level on the tooth’s surface. 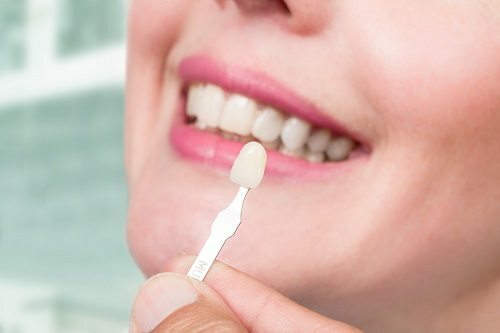 If you’d like to find out more about veneers and whether they’re right for you, book a consultation with our qualified team of cosmetic dentists. We provide both composite resin and porcelain veneers in Adelaide. Call us on 08 8231 9922 or contact us online if you’d like to book an appointment or ask any questions about our dental treatments.